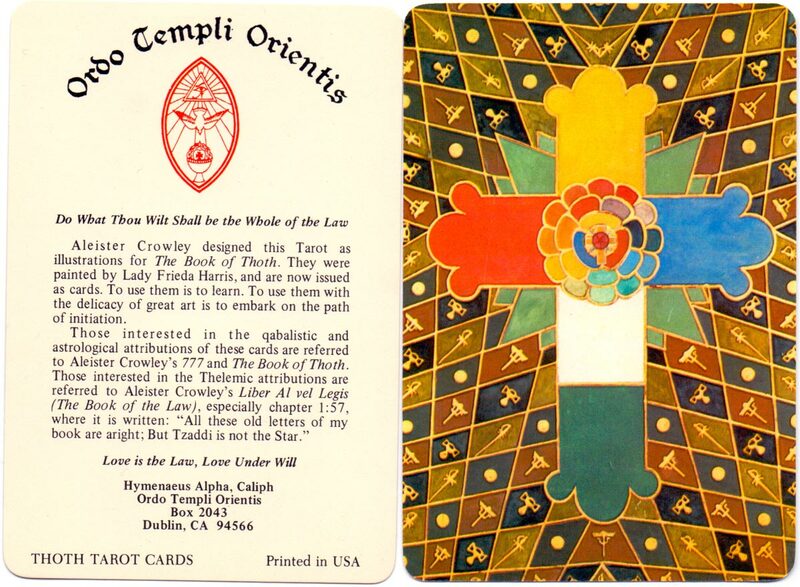 The Thoth Tarot was painted by Lady Frieda Harris (1877-1962) under the guidance of Aleister Crowley (1875-1947) during WWII, a time of great national anguish. Crowley and Lady Freda Harris worked on the illustrations between 1938 and 1943. This was the time when the Stalinist terror regime was in full swing and Hitler’s dictatorship was in it’s final throes, only a few years before George Orwell published his dystopian novel “1984”. The designs are of very great talent and ingenuity, executed with intensity, reflecting a projection into the future of a society overshadowed by dark forces. The cartomantic illustrations feature symbolism derived from Crowley's hotch-potch of disparate disciplines and occult systems. Above: Aleister Crowley Tarot cards, designed between 1938 and 1943. This is the 1st edition by Llewellyn Publications, St Paul, USA, c.1972. 78 cards + title card in slip case. The cards have unornamented borders, and no Hebrew letters or astrological symbols are present. Later editions have these features added. The original paintings were made with wartime materials, and are currently housed in the Warburg Institute, London, where they are beginning to show signs of deterioration.